Oklahoma was abjectly terrible on defense in 2017. I recently had a fun debate with Allen Kenney and Rufus Alexander over what went wrong and why but there wasn’t any debate over whether the defense played at an acceptable level. The 2015 Oklahoma defense was one of the better units they’ve had of late, which is why they were able to survive some of their growing pains with Mayfield and the young OL that season and go to the playoffs. They ranked 22nd nationally in S&P+ and had a nice formula built around a few key features. One was the Eric Striker/Devante Bond OLB combo that combined for 10 sacks (seven from Striker). Bond wasn’t an amazing OLB, if Obo had been ready to own that role the 2015 OU defense would have been legendary, but he was a decent football player and he know how to drop in coverage. Perhaps a bigger factor was the DL, which included Charles Walker and Charles Tapper, who had 10 TFL and six sacks and 10 TFL and seven sacks respectively. That defense also had three ILBs that knew what they were doing in Dom Alexander, Jordan Evans, and Frank Shannon and then some safeties in Steven Parker and Ahmad Thomas that also knew where to be. Finally, they struck gold when they were able to pair the ultra-athletic Jordan Thomas with veteran Zach Sanchez at either corner spot. Those two combined for 12 INTs and made Oklahoma’s 3-4 defense considerably more viable. Then in 2016 they lost Striker, Tapper, and Walker up front, Dom Alexander in the middle, and Sanchez on the edge and didn’t have many replacements ready to go. They slipped to 55th in defensive S&P+ and struggled to get pass-rush outside of emergent star Jack OLB Obo Okoronkwo. They struggled to find a CB to play opposite Jordan Thomas, and the lack of impact play from the DL spots exposed the lack of quality at ILB or safety. Heading into 2017 there was optimism because 5-star freshman Caleb Kelly had emerged as a OLB to play opposite Obo which could finally give the Sooners the OLB tandem they’d been aiming for and Thomas was returning to offer the Sooners another shot at building another good CB tandem. Obviously the Kelly-Obo tandem didn’t amount to much, producing 20.5 TFL and nine sacks but 17 TFL and eight sacks coming from Obo. Instead of being a lockdown CB that Oklahoma could build around and lean on while protecting their OLBs, Jordan Thomas collapsed. Most notably against Baylor, who completed 11 passes to Denzel Mims for 192 yards and three TDs. Safety and ILB continued to be a place where young and not particularly impactful players could be found and while DL improved they didn’t put it together and were higher on the “big guys that could beat blocks and stuff the run” than impact pass-rushers like Tapper or Walker. The unit fell to 101st in the S&P+ rankings, were a constant source of content for me, and were humiliated by Georgia in the playoffs. The reason I went over the last few years of OU defense, beyond highlighting how they’ve failed to raise up new impact players to replace the old ones, is to note how much of a difference it makes when you have a dominant component to your unit. Level 1 of playing good defense in this league is to avoid having holes anywhere. Level 2 involves having a few guys that you can really lean on to hold up in isolation, level 3 requires having the pieces to attack offenses. In 2015 Oklahoma wasn’t totally without holes but they were closer to a “level 3” defense because they had three guys up front that could win a 1-on-1 and get into the backfield in Striker, Tapper, and Walker. In 2016 and 2017 they didn’t even play at level 1 most of the time. Word out of camp has Addison Gumbs showing a ton of promise as a pass-rusher but former blue chipper Mark Jackson probably playing ahead of him at Jack OLB, Neville Gallimore moving to nose tackle, and the Sooners trying to land ND grad transfer Jay Hayes to replace DJ Ward at strong side end only to lose him to Georgia. Amusingly (to me at least), the Sooners probably have the players to run a good four-down front this year that rotates Jackson, Gumbs, and Kenneth Mann at the DE spots. By all accounts though they intend to stick with the three-down front that requires that they either play a pass-rushing OLB at Sam LB who’s asked to cover too much space and limits their options in coverage or to play freshman Brendan Radley-Hiles (Boo Radley!) as a nickel. The Sooners have a tough challenge just in maintaining the level they were at a year ago with Obo, but it seems likely they will at least do that. Beyond playing stout run defense though, I’m not sure if this front will improve in the pass-rushing department. Gallimore is hard to move and should fit well at the nose, they also have a cast of other “hard to move” types and Amani Bledsoe is a good 3-technique provided that you aren’t depending on him to provide the pass-rush. This is where Oklahoma was really weak a year ago. Emmanuel Beal was a sensational athlete but you would rarely guess it from his play a year ago, Kenneth Murray was a promising LB but just a true freshman and error prone, safety was a revolving door and none of the doors had locks on them. The plan this year is to lean on Murray and Kelly at the Mike and Will LB spots while developing Levi Draper and Jon-Michael Terry behind them. After watching the spring game my impression was that while the Sooners have a nice collection of talents here, they aren’t in very good shape for the 2018 season. These are some big, traditionally sized LBs. Now as it happens, Kelly and Murray are both pretty mobile and can get out into space, but none of them are as quick as Beal and these aren’t guys that you can ask to split the difference between a slot and a B-gap, especially the back-ups. But that’s not a huge deal as OU tends to drop a safety and allow these guys to work in a narrower space. The only issue here is that if and when OU has to turn to the LB bench they aren’t plugging in erasers that can cover a ton of ground. The bigger issue is that it’s not particularly likely that these guys will produce a LB corps in the coming season that can consistently be in position to make stops, much less to make the most of playing behind the DL if it proves to be a solid wall in run defense. This is the JMT (#40) and Draper (#30) tandem at work out there. Draper is initially in position before, at the last minute, he chooses to wander into traffic rather than take on and properly spill the pulling guard. JMT is a bit slow to scrape over because he’s trying to tend the cutback lanes I guess, but both the back and the pulling guards should be sending him a much stronger signal to scrape to the point of attack. The OLB play here isn’t particularly good either, particularly on the boundary where Gumbs (#15) is just flying up the field at the QB with little heed to actually boxing the play in as the force player. It is a blitz but you have to be more in control than that. Good job by Boo Radley cleaning this up from safety but that’s still a big gain that the O got here and about 15 yards on an A-gap run before the ballcarrier was touched by a defender. The LBs also got lost in coverage quite a bit, which isn’t shocking but it isn’t terribly comforting either. Grant Calcaterra was torching them all game and they often seemed to regard routes that ventured into the flats to be someone else’s problem. On the bright side, neither Caleb Kelly nor Kenneth Murray played in the spring game so the unsteady play was on the part of the back-ups. On the negative side, the back-ups don’t look at all ready, Kelly has never played ILB before, and even Murray is still only a sophomore. Meanwhile back at safety, the Sooners probably roll with senior Kahlil Haughton who’s had four years to try and understand Mike Stoops’ coverages now, and either Chanse Sylvie or Robert Barnes. Neither of those guys played in the spring game and instead we got a glimpse of freshman Patrick Fields, who seems promising enough. It seems like Barnes is a favorite to get some action but I have some reservations about his fit both in this scheme and with the rest of the 2018 roster. He’s a big guy who’s claim to fame is as a box support guy and an enforcer over the middle. The concern has to do with his ability to cover down on a slot and how much range and cover he can provide for the LBs in the event of mishaps. This is where things appear most positive for Oklahoma. Boo Radley can do many of the things you need from your nickel, like accurately match routes, blitz the edge, and tackle in the open field. Meanwhile outside it looks like Tre Brown could be the lockdown corner they need and Parnell Motley, Jordan Parker, and Tre Norwood adds up to a lot of options for finding a second quality option. So it appears that the Sooners may have a sturdy enough DL with at least one (though maybe not more) guy on the line who can consistently win a 1-on-1 in the pass rush from whoever wins the starting Jack OLB job. Behind them they have a pair of explosive if unproven LBs in Murray and Kelly and then an option at Sam I guess in Ryan Jones. Finally, there’s a ton of guys on this roster that know how to cover both at CB or inside at nickel and safety. The obvious option for the Sooners is to bring a lot of blitzes in 2018 and lean on their ability to drop down safeties and play some man coverage outside. …and they can also bring some five-man stuff as well. When the defense is in nickel it becomes important that one or both ILBs can be useful and regular blitzers, which should be the case with Kelly now at the will. 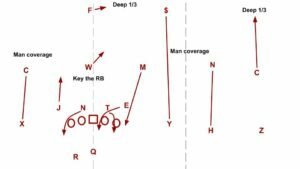 Then you can drop the Jack into coverage like above and use stunts and inserts from the ILBs to bring pressure. Or you bring an ILB and the Jack, or whichever combo seems most likely to blow up the protection scheme of the opponent that week. Of course you want your LBs in coverage to do better than Draper did here, losing the RB. Also, the path for either the stunting DT or the blitzing LB is wrong since they both end up wide and basically in the same gap. This film isn’t keeping anyone up at night. The execution needs to get tightened up considerably and the blitzing LBs have to make their presence felt in the backfield or else you’re just playing short-manned in coverage and on run D for no good reason. Will the young Sooners be able to leverage some athletic LBs and a deeper and more reliable secondary into a good, attacking defense in 2018? No, probably not. But that’s the path and there’s a chance it works out.